I’m writing this in a Microsoft Word 2010 window that fills less than half of my screen. Also visible are two Chrome windows—one containing my inbox, the other some pages relevant to this article—and Windows Media Player, which reports to me that I’m listening to Beethoven’s Seventh Symphony. I can easily get to any installed program with a few clicks of my mouse. You can probably guess that I’m not using Windows 8. I have a copy of it set up on another PC for testing purposes, but for the PC I do my work on, I need a powerful and versatile operating system that lets me arrange programs and windows as I see fit. For these purposes, Windows 7 qualifies; Windows 8 does not. Windows without windows: Does anyone at Microsoft understand that Windows is called Windows because it has windows? That seemingly obvious fact harkens back to a time before the geniuses in Redmond decided to weigh us down with the Interface Formerly Known as Metro (which I’ll abbreviate to IFKaM). The Windows 8 Start screen has no windows. At best, you can display two programs side by side, and even doing that is impossible if your screen’s horizontal resolution is less than 1366. But the lack of actual windows isn’t IFKaM’s worst flaw. You can still organize the Start page by dragging your productivity apps, your media players, and your utilities into separate groups; however, IFKaM doesn’t allow you to arrange your programs hierarchically, like folders on a hard drive or submenus on the Start menu. Instead, you must accept an arrangement where everything is displayed up front. The crippled Windows desktop: Windows 8 retains the old user interface, which is now officially called Desktop, but in a sadly hobbled form. You can’t use Desktop as your default interface. You can’t boot into it or close Windows from it. On the other hand, you can manage files in Desktop. There’s no IFKaM equivalent of Windows Explorer. Even worse, Microsoft has removed the Start menu, except for a cut-down version called “simplified start.” Introduced in Windows 95 and improved many times since, the Start menu has evolved into a brilliant work of convenience. 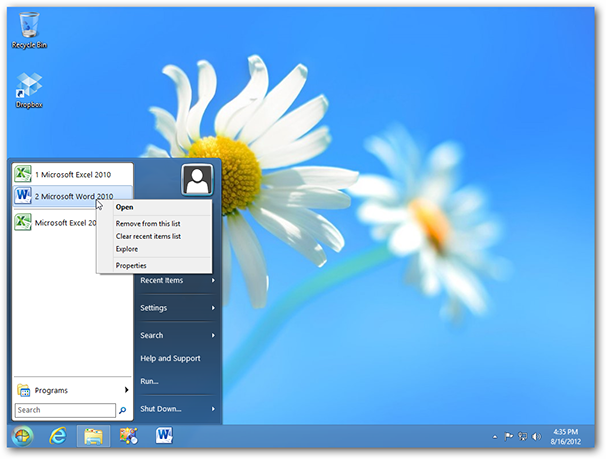 In Windows 8, you can add third-party Start menu replacements, like Classic Start, but Microsoft should have kept the original Start menu as an option. Think about all you can do with the Windows 7 Start menu. You can pin shortcuts to programs to its top level, but you don’t have to, because the programs you use frequently show up there automatically. Each shortcut contains a menu of recently used and recently pinned data files. Two operating systems, little common ground: To make things worse, the two separate interfaces don’t play well together. Going from one to the other is just plain crazy. It could have been so much better: Microsoft totally missed the boat here. We don’t need a confusing mix of Desktop and IFKaM applications. We need an OS that can change its user interface when we change our hardware. It should all be configurable, and you should be free to decide what criteria create the change—or you should have the option of sticking with the interface you prefer. Alas, Microsoft didn’t choose that route. So I’ll stay with Windows 7 for as long as I can, and hope that the company fixes everything in Windows 9 (or better yet, Windows 8 SP1). And if Microsoft doesn’t? Well, that’s why we have Apple and Linux.